One of the deepest sympathies we have as humans is for a mother who is carrying a baby or babies inside her, and that naturally extends to a doggie mother too, but this story tells of a time that such things made no difference at all to the awful decision! The mother, in this case, was a pregnant pit bull, in the Texas area and it was reported that she was euthanized while she was still in labor, we are really shocked, even more than any other time, aren’t you? Well, it seems people are certainly feeling emotive towards this case because it’s going viral all over the place, and that doesn’t surprise us at all! 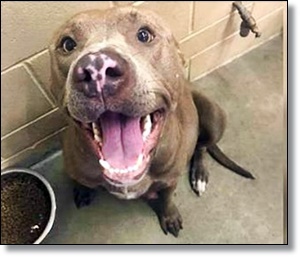 Amarillo Animal Management and Welfare volunteer, Dacia Anderson, posted a photo of the doggie and a story about what was ha happened that day. To read more on this story, click here: Put To Sleep While Giving Birth, Rescue Center Says It Was The Right Call!